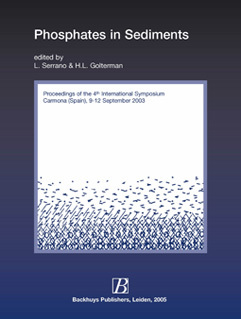 Preface This publication presents the Proceedings of the 4th International Symposium on phosphate in sediments held at Carmona (Spain) from 9 to 12 Sept. 2003. These P-symposia are the spin-off of the first symposium “Interactions between sediments and fresh water”, held at Amsterdam, 6 – 10 Sept. 1976. The proceedings of that symposium were edited by Golterman, 1976. The second sediment symposium was held in Kingston, Canada, 1981 and the third in Geneva in 1984. During the Amsterdam meeting a group of scientists concentrating their work on phosphate in sediments decided that it would be useful to have a meeting dedicated to this subject only. In Geneva it was decided to have the first symposium on Phosphate in Sediments, which was finally organized in the Department of Limnology, University of Vienna; the proceedings were edited by Psenner & Gunatilaka (1988). The second symposium was organized in the Laboratory of Limnology of the University of Uppsala (Sweden) in 1988. No proceedings were published; a short report is published by Enell et al., 1989. The third one was held at Woudschoten (Netherlands) in 1991. The proceedings were published by Boers et al. (1993). 1) Exchange and release processes (7 lectures; Chairman: C. Bonetto) In this session the following papers or posters were read: G. Bally et al., J. Borovec, A. Maine et al. (2 papers), A. Mitchell et al., G. Nürnberg & H. Cyr, L. Serrano et al. 2) Vertical distribution in sediment; P-Composition & Availability (6 lectures; chairman: M. A. Maine) In this session the following papers were read: A. deVicente et al., W. Eckert & A. Nishri, A. Maine et al., A. Jorcin et al., B. Ruiz, et al., M. T. Barral et al. 3) Methodology (5 lectures; chairman: P. Ekholm) In this session the following papers were read: P. Ekholm, H. Jensen, M. K. Leivuori et al., C. Orona et al., K. Reitzel. 4) P-transformations (3 lectures; chairman: A. Kleeberg) In this session the following papers were read: R. Gilbin et al., B. Grüneberg et al., H. Mugni & C. Bonetto. 5) P-Transport and Fluxes (5 lectures; Chairman: F. Ø. Andersen) In this session the following papers were read: M. Alvarez et al., M. Flindt, J. Lewandoski, H. Mugni et al., H. Golterman. 6) Miscellaneous topics (8 lectures; chairman: D. Baldwin) In this session the following papers were read: A. Kleeberg et al., D. R. Thomsen et al., G. Wauer et al., D. Baldwin, U. Selig et al., K. B. Nielsen & F. Ø. Andersen, M. E. Jacobson-Meyers et al., Shigeo Tsujimura. Furthermore there was ample time for discussions, stimulated by the atmosphere and splendour of the Parador. Not all papers were submitted for publication. – The chemical composition of organic phosphates, especially the humic bound phosphate. – The separation between phytate phosphates and polyphosphates. – The release of phosphate especially following the onset of anoxic conditions. – The measurement of interstitial phosphate concentrations by using ‘peepers’, cores or (micro) electrodes. – Phosphates in very acid environments. Chemistry and limnology: A marriage de raison? What happens after phosphate is released from the sediment in stratifying lakes? Is exudation of organic acids by Littorella uniflora a mechanism for sediment phosphate dissolution?